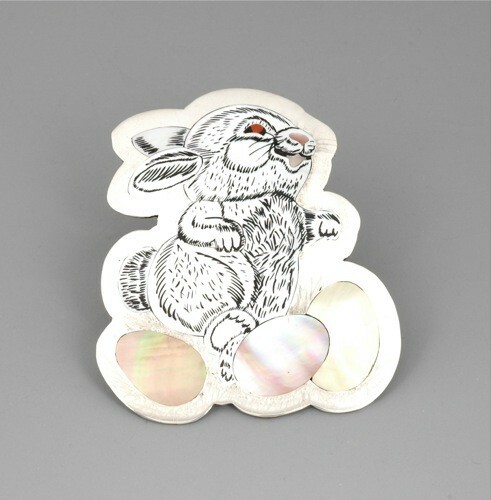 With Easter on the way, we're offering this adorable Dale Edaakie bunny rabbit pin. Dale Edaakie, from Zuni Pueblo, does the finest inlay jewelry - just look at the detail on this little bunny - from the gleeful little mouth to the nose, whiskers and little red eye (with eyelashes too) - Dale has used shell of varying color to bring the bunny to life. She's dancing with three colored Easter eggs. The dimensions are 3"H x 2 1/2"W. It is signed multiple times with Dale Edaakie's name stamped into the silver on the reverse side. If you prefer brown, we've got a brown Easter bunny too. Dale is the son of master Zuni jewelers Dennis and Nancy Edaakie.